The clinical symptoms of idiopathic pulmonary fibrosis are nonspecific and can be shared with many pulmonary and cardiac diseases. Most patients present with a gradual onset (often >6 mo) of exertional dyspnea and/or a nonproductive cough. Approximately 5% of patients have no presenting symptoms when idiopathic pulmonary fibrosis is serendipitously diagnosed. High-resolution computed tomography (HRCT) scanning: Sensitive, specific, and essential for the diagnosis of idiopathic pulmonary fibrosis. Demonstrates patchy, peripheral, subpleural, and bibasilar reticular opacities. 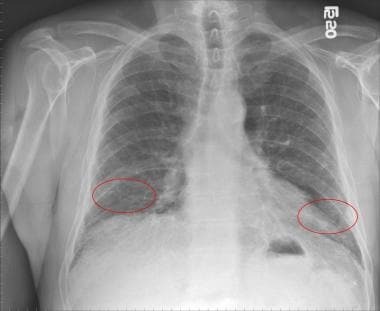 Chest radiograph of a patient with idiopathic pulmonary fibrosis showing bilateral lower lobe reticular opacities (red circles). Bronchoscopy: Absence of lymphocytosis in bronchoalveolar lavage fluid may be important for the diagnosis (increased neutrophils [70-90% of patients] and eosinophils [40-60% of all patients]). This procedure may be used to exclude alternative diagnoses. Surgical lung biopsy (via open lung biopsy or video-assisted thoracoscopic surgery [VATS] [preferred]): Best sample for distinguishing usual interstitial pneumonia from other idiopathic interstitial pneumonias. The optimal medical therapy for the treatment of idiopathic pulmonary fibrosis has yet to be identified. Treatment strategies for idiopathic pulmonary fibrosis include the assessment and management of comorbid conditions according to current practice guidelines, including chronic obstructive pulmonary disease, obstructive sleep apnea, gastroesophageal reflux disease, and coronary artery disease. Encourage tobacco users to quit and offer pharmacotherapy as needed. Prescribe oxygen therapy in patients with hypoxemia at rest or with exercise (partial pressure of oxygen [PaO2] < 55 mmHg or an oxygen saturation by pulse oximetry [SpO2] < 88%). The goal is to maintain an oxygen saturation of at least 90% at rest, with sleep, and with exertion. Vaccinate patients against influenza and pneumococcal infection. Excess alveolar epithelial cell apoptosis and fibroblast resistance to apoptosis are also believed to contribute to fibroproliferation in idiopathic pulmonary fibrosis. Research has demonstrated that prostaglandin E2 deficiency, in lung tissue of patients with pulmonary fibrosis, results in increased sensitivity of alveolar epithelial cells to FAS-ligand induced apoptosis but induces fibroblast resistance to Fas-ligand induced apoptosis. Therefore, apoptosis resistance in the fibroblasts and myofibroblasts participating in the repair of the alveolar epithelium may contribute to the persistent and/or progressive fibrosis in idiopathic pulmonary fibrosis. The recognition of the above-mentioned factors as contributors to the pathogenesis of idiopathic pulmonary fibrosis has led to the development of novel approaches to treat idiopathic pulmonary fibrosis. No large-scale studies of the incidence or prevalence of idiopathic pulmonary fibrosis (IPF) are available on which to base formal estimates. Epidemiologic data from large, geographically diverse populations are limited, and, therefore this data cannot be used to accurately determine the existence of a racial predilection for idiopathic pulmonary fibrosis. Patients with idiopathic pulmonary fibrosis who have concomitant pulmonary hypertension have more dyspnea, greater impairment of their exercise capacity, and increased 1-year mortality compared with their counterparts without pulmonary hypertension. Additionally, a multicenter prospective cohort study of 126 lung transplant procedures performed for idiopathic pulmonary fibrosis revealed elevated pulmonary artery pressure as a risk factor for primary graft dysfunction (PGD) following lung transplantation. The mean pulmonary artery pressure (mPAP) for patients with PGD following lung transplantation was 38.5 ± 16.3 mm Hg compared with a mPAP of 29.6 ± 11.5 mm Hg in patients without PGD following lung transplantation. Patients should be presented information regarding the full range of options available for treating idiopathic pulmonary fibrosis (IPF). The pros, cons, risks, benefits, and alternatives should be discussed in a balanced and comprehensive fashion. For patient education resources, see the Lung and Airway Center. Raghu G, Collard HR, Egan JJ, Martinez FJ, Behr J, Brown KK. An Official ATS/ERS/JRS/ALAT Statement: Idiopathic Pulmonary Fibrosis: Evidence-based Guidelines for Diagnosis and Management. Am J Respir Crit Care Med. 2011 Mar 15. 183(6):788-824. [Medline]. Frankel SK, Schwarz MI. Update in idiopathic pulmonary fibrosis. Curr Opin Pulm Med. 2009 Sep. 15(5):463-9. [Medline]. [Guideline] Raghu G, Remy-Jardin M, Myers JL, et al. Diagnosis of Idiopathic Pulmonary Fibrosis. An Official ATS/ERS/JRS/ALAT Clinical Practice Guideline. Am J Respir Crit Care Med. 2018 Sep 1. 198 (5):e44-e68. [Medline]. Patel NM, Lederer DJ, Borczuk AC, Kawut SM. Pulmonary hypertension in idiopathic pulmonary fibrosis. Chest. 2007 Sep. 132(3):998-1006. [Medline]. Fishman A, Elias J, Fishman J, Grippi M, Senior R, Pack A. Idiopathic Pulmonary Fibrosis. Fishman AP. Fishman's Pulmonary Diseases and Disorders. 4th ed. The McGraw-Hill Companies, Inc.; 2008. Vol 1: 1143-60. Martinez FJ, Flaherty K. Pulmonary function testing in idiopathic interstitial pneumonias. Proc Am Thorac Soc. 2006 Jun. 3(4):315-21. [Medline]. [Full Text]. Flaherty KR, Andrei AC, Murray S, et al. Idiopathic pulmonary fibrosis: prognostic value of changes in physiology and six-minute-walk test. Am J Respir Crit Care Med. 2006 Oct 1. 174(7):803-9. [Medline]. [Full Text]. Misumi S, Lynch DA. Idiopathic pulmonary fibrosis/usual interstitial pneumonia: imaging diagnosis, spectrum of abnormalities, and temporal progression. Proc Am Thorac Soc. 2006 Jun. 3(4):307-14. [Medline]. Orens JB, Estenne M, Arcasoy S, et al. International guidelines for the selection of lung transplant candidates: 2006 update--a consensus report from the Pulmonary Scientific Council of the International Society for Heart and Lung Transplantation. J Heart Lung Transplant. 2006 Jul. 25(7):745-55. [Medline]. Ley B, Collard HR, King TE Jr. Clinical course and prediction of survival in idiopathic pulmonary fibrosis. Am J Respir Crit Care Med. 2011 Feb 15. 183(4):431-40. [Medline]. Kim DS, Collard HR, King TE Jr. Classification and natural history of the idiopathic interstitial pneumonias. Proc Am Thorac Soc. 2006 Jun. 3(4):285-92. [Medline]. [Full Text]. Visscher DW, Myers JL. Histologic spectrum of idiopathic interstitial pneumonias. Proc Am Thorac Soc. 2006 Jun. 3(4):322-9. [Medline]. Verma S, Slutsky AS. Idiopathic pulmonary fibrosis--new insights. N Engl J Med. 2007 Mar 29. 356(13):1370-2. [Medline]. Harari S, Caminati A. IPF: new insight on pathogenesis and treatment. Allergy. 2010 May. 65(5):537-53. [Medline]. Chen H, Chen Q, Jiang CM, Shi GY, Sui BW, Zhang W, et al. Triptolide suppresses paraquat induced idiopathic pulmonary fibrosis by inhibiting TGFB1-dependent epithelial mesenchymal transition. Toxicol Lett. 2017 Nov 28. 284:1-9. [Medline]. Giménez A, Duch P, Puig M, Gabasa M, Xaubet A, Alcaraz J. Dysregulated Collagen Homeostasis by Matrix Stiffening and TGF-β1 in Fibroblasts from Idiopathic Pulmonary Fibrosis Patients: Role of FAK/Akt. Int J Mol Sci. 2017 Nov 16. 18 (11):[Medline]. Thannickal VJ, Horowitz JC. Evolving concepts of apoptosis in idiopathic pulmonary fibrosis. Proc Am Thorac Soc. 2006 Jun. 3(4):350-6. [Medline]. [Full Text]. Maher TM, Evans IC, Bottoms SE, Mercer PF, Thorley AJ, Nicholson AG. Diminished prostaglandin E2 contributes to the apoptosis paradox in idiopathic pulmonary fibrosis. Am J Respir Crit Care Med. 2010 Jul 1. 182(1):73-82. [Medline]. Armanios MY, Chen JJ, Cogan JD, et al. Telomerase mutations in families with idiopathic pulmonary fibrosis. N Engl J Med. 2007 Mar 29. 356(13):1317-26. [Medline]. Seibold MA, Wise AL, Speer MC, Steele MP, Brown KK, Loyd JE. A common MUC5B promoter polymorphism and pulmonary fibrosis. N Engl J Med. 2011 Apr 21. 364(16):1503-12. [Medline]. Wang XM, Zhang Y, Kim HP, et al. Caveolin-1: a critical regulator of lung fibrosis in idiopathic pulmonary fibrosis. J Exp Med. 2006 Dec 25. 203(13):2895-906. [Medline]. [Full Text]. Lawson WE, Loyd JE. The genetic approach in pulmonary fibrosis: can it provide clues to this complex disease?. Proc Am Thorac Soc. 2006 Jun. 3(4):345-9. [Medline]. [Full Text]. Townsley DM, Dumitriu B, Liu D, Biancotto A, Weinstein B, Chen C, et al. Danazol Treatment for Telomere Diseases. N Engl J Med. 2016 May 19. 374 (20):1922-31. [Medline]. Wootton SC, Kim DS, Kondoh Y, et al. Viral infection in acute exacerbation of idiopathic pulmonary fibrosis. Am J Respir Crit Care Med. 2011 Jun 15. 183(12):1698-702. [Medline]. [Full Text]. Fernandez Perez ER, Daniels CE, Schroeder DR, et al. Incidence, prevalence, and clinical course of idiopathic pulmonary fibrosis: a population-based study. Chest. 2010 Jan. 137(1):129-37. [Medline]. [Full Text]. Raghu G, Weycker D, Edelsberg J, Bradford WZ, Oster G. Incidence and prevalence of idiopathic pulmonary fibrosis. Am J Respir Crit Care Med. 2006 Oct 1. 174(7):810-6. [Medline]. Olson AL, Swigris JJ, Lezotte DC, Norris JM, Wilson CG, Brown KK. Mortality from pulmonary fibrosis increased in the United States from 1992 to 2003. Am J Respir Crit Care Med. 2007 Aug 1. 176(3):277-84. [Medline]. du Bois RM, Weycker D, Albera C, Bradford WZ, Costabel U, Kartashov A, et al. Ascertainment of individual risk of mortality for patients with idiopathic pulmonary fibrosis. Am J Respir Crit Care Med. 2011 Aug 15. 184(4):459-66. [Medline]. Ley B, Ryerson CJ, Vittinghoff E, et al. A Multidimensional Index and Staging System for Idiopathic Pulmonary Fibrosis. Annals of Internal Medicine. 2012/05. 156:684-691. Fang A, Studer S, Kawut SM, Ahya VN, Lee J, Wille K. Elevated Pulmonary Artery Pressure Is a Risk Factor for Primary Graft Dysfunction Following Lung Transplantation for Idiopathic Pulmonary Fibrosis. Chest. 2011 Apr. 139(4):782-787. [Medline]. Flaherty KR, Thwaite EL, Kazerooni EA, et al. Radiological versus histological diagnosis in UIP and NSIP: survival implications. Thorax. 2003 Feb. 58(2):143-8. [Medline]. [Full Text]. Tzilas V, Koti A, Papandrinopoulou D, Tsoukalas G. Prognostic factors in idiopathic pulmonary fibrosis. Am J Med Sci. 2009 Dec. 338(6):481-5. [Medline]. Kinder BW, Brown KK, Schwarz MI, Ix JH, Kervitsky A, King TE Jr. Baseline BAL neutrophilia predicts early mortality in idiopathic pulmonary fibrosis. Chest. 2008 Jan. 133(1):226-32. [Medline]. Kinder BW, Brown KK, McCormack FX, et al. Serum surfactant protein-A is a strong predictor of early mortality in idiopathic pulmonary fibrosis. Chest. 2009 Jun. 135(6):1557-63. [Medline]. [Full Text]. Antoniou KM, Hansell DM, Rubens MB, et al. Idiopathic pulmonary fibrosis: outcome in relation to smoking status. Am J Respir Crit Care Med. 2008 Jan 15. 177(2):190-4. [Medline]. Lancaster LH, Mason WR, Parnell JA, et al. Obstructive sleep apnea is common in idiopathic pulmonary fibrosis. Chest. 2009 Sep. 136(3):772-8. [Medline]. [Full Text]. Lynch DA, Sverzellati N, Travis WD, Brown KK, Colby TV, Galvin JR, et al. Diagnostic criteria for idiopathic pulmonary fibrosis: a Fleischner Society White Paper. Lancet Respir Med. 2017 Nov 15. [Medline]. du Bois RM, Weycker D, Albera C, Bradford WZ, Costabel U, Kartashov A, et al. Forced vital capacity in patients with idiopathic pulmonary fibrosis: test properties and minimal clinically important difference. Am J Respir Crit Care Med. 2011 Dec 15. 184(12):1382-9. [Medline]. Swigris JJ, Swick J, Wamboldt FS, et al. Heart rate recovery after 6-min walk test predicts survival in patients with idiopathic pulmonary fibrosis. Chest. 2009 Sep. 136(3):841-8. [Medline]. [Full Text]. Bois RM, Weycker D, Albera C, et al. Six-minute-walk test in idiopathic pulmonary fibrosis: test validation and minimal clinically important difference. Am J Respir Crit Care Med. 2011 May 1. 183(9):1231-7. [Medline]. Ohshimo S, Bonella F, Cui A, et al. Significance of bronchoalveolar lavage for the diagnosis of idiopathic pulmonary fibrosis. Am J Respir Crit Care Med. 2009 Jun 1. 179(11):1043-7. [Medline]. Lee JS, Ryu JH, Elicker BM, Lydell CP, Jones KD, Wolters PJ, et al. Gastroesophageal reflux therapy is associated with longer survival in patients with idiopathic pulmonary fibrosis. Am J Respir Crit Care Med. 2011 Dec 15. 184(12):1390-4. [Medline]. Kozower BD, Meyers BF, Smith MA, et al. The impact of the lung allocation score on short-term transplantation outcomes: a multicenter study. J Thorac Cardiovasc Surg. 2008 Jan. 135(1):166-71. [Medline]. Weiss ES, Allen JG, Merlo CA, Conte JV, Shah AS. Survival after single versus bilateral lung transplantation for high-risk patients with pulmonary fibrosis. Ann Thorac Surg. 2009 Nov. 88(5):1616-25; discussion 1625-6. [Medline]. Schaffer JM, Singh SK, Reitz BA, Zamanian RT, Mallidi HR. Single- vs double-lung transplantation in patients with chronic obstructive pulmonary disease and idiopathic pulmonary fibrosis since the implementation of lung allocation based on medical need. JAMA. 2015 Mar 3. 313 (9):936-48. [Medline]. Atsumi K, Saito Y, Kuse N, Kobayashi K, Tanaka T, Kashiwada T, et al. Prognostic Factors in the Acute Exacerbation of Idiopathic Pulmonary Fibrosis: A Retrospective Single-center Study. Intern Med. 2017 Nov 20. [Medline]. Song JW, Hong SB, Lim CM, Koh Y, Kim DS. Acute exacerbation of idiopathic pulmonary fibrosis: incidence, risk factors and outcome. Eur Respir J. 2011 Feb. 37(2):356-63. [Medline]. Magnani D, Lenoci G, Balduzzi S, Artioli G, Ferri P. Effectiveness of support groups to improve the quality of life of people with idiopathic pulmonary fibrosis a pre-post test pilot study. Acta Biomed. 2017 Nov 30. 88 (5-S):5-12. [Medline]. Root ED, Graney B, Baird S, Churney T, Fier K, Korn M, et al. Physical activity and activity space in patients with pulmonary fibrosis not prescribed supplemental oxygen. BMC Pulm Med. 2017 Nov 23. 17 (1):154. [Medline]. Raghu G, Rochwerg B, Zhang Y, Garcia CA, Azuma A, et al. An Official ATS/ERS/JRS/ALAT Clinical Practice Guideline: Treatment of Idiopathic Pulmonary Fibrosis. An Update of the 2011 Clinical Practice Guideline. Am J Respir Crit Care Med. 2015 Jul 15. 192 (2):e3-e19. [Medline]. Phillips D. New Guideline Updates Diagnostic Criteria for IPF. Medscape Medical News. Available at https://www.medscape.com/viewarticle/901860. September 12, 2018; Accessed: September 26, 2018. Behr J, Kolb M, Cox G. Treating IPF--all or nothing? A PRO-CON debate. Respirology. 2009 Nov. 14(8):1072-81. [Medline]. Wiertz IA, Wuyts WA, van Moorsel CHM, Vorselaars ADM, van Es HW, van Oosterhout MFM, et al. Unfavourable outcome of glucocorticoid treatment in suspected idiopathic pulmonary fibrosis. Respirology. 2017 Dec 5. [Medline]. Demedts M, Behr J, Buhl R, et al. High-dose acetylcysteine in idiopathic pulmonary fibrosis. N Engl J Med. 2005 Nov 24. 353(21):2229-42. [Medline]. Prednisone, Azathioprine, and N-Acetylcysteine for Pulmonary Fibrosis. N Engl J Med. 2012 May 20. [Medline]. National Heart, Lung, and Blood Institute. Clinical Alert: Commonly Used Three-Drug Regimen for Pulmonary Fibrosis Found Harmful. NIH Stops One Treatment Arm of Trial; Other Two Treatments to Continue. National Institutes of Health. October 21, 2011. Available at http://www.nlm.nih.gov/databases/alerts/2011_nhlbi_ifp.html. Raghu G, Brown KK, Bradford WZ, et al. A placebo-controlled trial of interferon gamma-1b in patients with idiopathic pulmonary fibrosis. N Engl J Med. 2004 Jan 8. 350(2):125-33. [Medline]. Raghu G, Brown KK, Costabel U, et al. Treatment of idiopathic pulmonary fibrosis with etanercept: an exploratory, placebo-controlled trial. Am J Respir Crit Care Med. 2008 Nov 1. 178(9):948-55. [Medline]. King TE Jr, Albera C, Bradford WZ, et al. Effect of interferon gamma-1b on survival in patients with idiopathic pulmonary fibrosis (INSPIRE): a multicentre, randomised, placebo-controlled trial. Lancet. 2009 Jul 18. 374(9685):222-8. [Medline]. King TE Jr, Behr J, Brown KK, et al. BUILD-1: a randomized placebo-controlled trial of bosentan in idiopathic pulmonary fibrosis. Am J Respir Crit Care Med. 2008 Jan 1. 177(1):75-81. [Medline]. The Idiopathic Pulmonary Fibrosis Clinical Research Network, Zisman DA, Schwarz M, Anstrom KJ, Collard HR, Flaherty KR. A controlled trial of sildenafil in advanced idiopathic pulmonary fibrosis. N Engl J Med. 2010 Aug 12. 363(7):620-8. [Medline]. Richeldi L, du Bois RM, Raghu G, Azuma A, Brown KK, Costabel U, et al. Efficacy and safety of nintedanib in idiopathic pulmonary fibrosis. N Engl J Med. 2014 May 29. 370(22):2071-82. [Medline]. Richeldi L, Costabel U, Selman M, et al. Efficacy of a tyrosine kinase inhibitor in idiopathic pulmonary fibrosis. N Engl J Med. 365:1079-1087. Noble PW, Albera C, Bradford WZ, et al. Pirfenidone in patients with idiopathic pulmonary fibrosis (CAPACITY): two randomised trials. Lancet. 2011 May 21. 377(9779):1760-9. [Medline]. King TE Jr, Bradford WZ, Castro-Bernardini S, Fagan EA, Glaspole I, Glassberg MK, et al. A phase 3 trial of pirfenidone in patients with idiopathic pulmonary fibrosis. N Engl J Med. 2014 May 29. 370(22):2083-92. [Medline]. Azuma A, Nukiwa T, Tsuboi E, et al. Double-blind, placebo-controlled trial of pirfenidone in patients with idiopathic pulmonary fibrosis. Am J Respir Crit Care Med. 2005 May 1. 171(9):1040-7. [Medline]. Taniguchi H, Ebina M, Kondoh Y, et al. Pirfenidone in idiopathic pulmonary fibrosis. Eur Respir J. 2010 Apr. 35(4):821-9. [Medline]. Esbriet® (pirfenidone). InterMune. Available at http://www.intermune.com/pirfenidone. Accessed: May 3, 2014. Classic subpleural honeycombing (red circle) in a patient with a diagnosis of idiopathic pulmonary fibrosis. A patient with IPF and a confirmed histologic diagnosis of usual interstitial pneumonia. Note the reticular opacities (red circle) distributed in both lung bases and the minimal ground-glass opacities (blue circle). A patient with nonspecific interstitial pneumonia. Note the predominance of ground-glass opacities (blue circles) and a few reticular lines (red arrow). Patchwork distribution of abnormalities in a classic example of usual interstitial pneumonia (low-magnification photomicrograph; hematoxylin and eosin stain; original magnification, X4). Courtesy of Chad Stone, MD. Table 1. Scoring for mortality risk in IPF. Table 2. Staging and mortality risk for IPF. The authors and editors of Medscape Reference gratefully acknowledge the contributions of previous authors, Rajesh G. Patel, MD, and Javier I. Diaz, MD, to the development and writing of this article.